“Viagra for the brain.” It’s a slogan designed to attract the attention of consumers concerned about cognition. 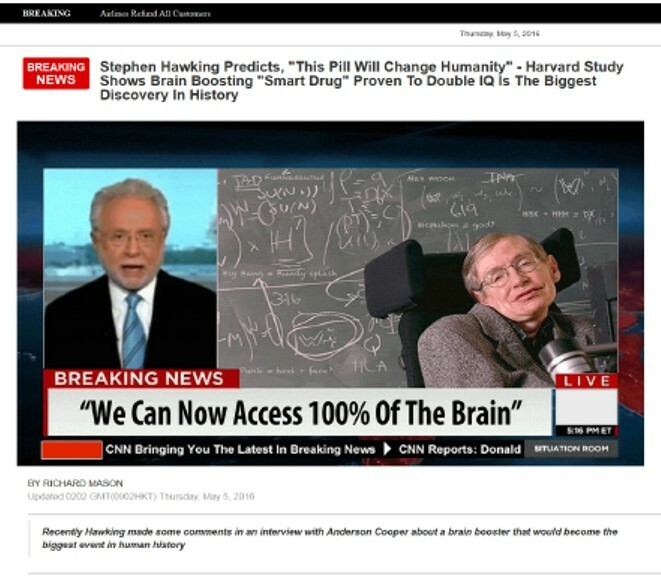 Then there was a massive online ad campaign of “news” websites featuring supposed testimonials from people like Bill Gates and the now-late Dr. Stephen Hawking. It’s no wonder people forked over millions for supplements that went by names like Geniux, Xcel, EVO, and Ion-Z. But according to proposed FTC settlements, the entire promotion was riddled with deception. If you have clients in the affiliate marketing ecosystem, the case merits particular attention. But the FTC says the promotion was rife with illegality. There wasn’t valid science to back up the cognition promises, the claims about clinicals were false, those “news” sites weren’t news sites at all, none of the big names dropped in the ads had anything to do with the promotions, and even commenters like “Dan” were phony. What’s more, consumers who asked for refunds were often stymied at every turn with contradictory conditions, unanswered customer service phone lines, and “the check is being processed” stall tactics. Among other things, the proposed orders require the defendants to have randomized clinical testing to support any disease claim and a host of cognition-related representations. They’re also barred from using sham news sites, bogus celebrity or consumer endorsements, and a broad range of other promotional techniques related to the conduct alleged in the complaint. In addition, the orders prohibit deceptive claims about cost, returns, refunds, billing, etc. Other provisions spell out what the defendants must do to keep tabs on what their affiliate networks and affiliate marketers are up to. One order imposes a $14.5 million judgment, which will be partially suspended after the defendants pay $523,000. The second order includes an $11.5 million financial remedy, which will be partially suspended when one defendant pays $100,000. Each judgment will come due if it turns out the defendants misrepresented their financial conditions. What can other companies take from the case? Have your science in gear before turning the ignition on cognition. Boomer consumers are concerned about cognitive decline, so advertisers are rushing in with preventatives and cures, often lacking in proof. That’s why misleading claims about memory and brain function remain a key FTC priority. Bogus testimonials and phony formats will land marketers in legal hot water. Whether it’s a false claim that a famous person uses a product or a glowing recommendation from a non-existent consumer, deceptive endorsements violate the FTC Act. The same holds true for ads that mislead consumers into thinking they’re news sites or other kinds of independent content. Twisted paths won’t throw legal bloodhounds off the scent. The complexity of the defendants’ corporate structures was rivaled only by its labyrinth of affiliate relationships. Convoluted networks don’t deter law enforcers and they won’t shield appropriate parties from liability. Look no further than the complaint in this case, which names merchants, an advertising service company, fulfillment companies, a payment processor, holding companies, and four individuals. Monitor what others are doing to help sell your product. “We don’t know who our affiliates are or what they’re up to.” It’s a common refrain, but it doesn’t cut much ice when consumers have been deceived. The orders in this case require the defendants to take specific steps to change their head-in-the-sand approach to affiliate marketing.